Last week on Game of Thrones, Jon Snow and Danny finally met. Of course, they don’t know that they are related (yet), so at this point, they are enemies who need to form an alliance. Danny needs to defeat Cersei, Jon needs to defeat the Night’s King. Their first meeting didn’t go off too well, but Danny allowed Jon to mine for dragon glass as a good faith gesture. Danny has her own problems though. She not only lost the Sand Snakes (as Ellaria has to now witness her daughter Tyene die before her eyes thanks to Cersei), but the Lannister army launched a sneak attack on Highgarden, ending the Tyrell family. Lady Olenna did get in her last laugh as she finally reveals to Jamie that she was responsible for Joffrey’s death, right before she died of a poison Jamie gave her. It’s can’t be said enough how freakin gangsta she was for that move! 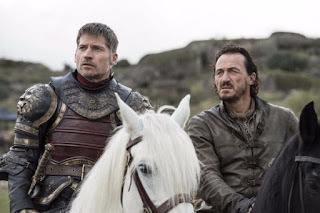 Jamie and Bronn are on their way back from Highgarden after defeating the Tully army. The Lannister now has enough gold to pay back the Iron Bank for all their debts. Of course, Jamie uses the Lannister mantra, “A Lannister Always Pays His Debts.” What about the debt you owe Bronn? He’s been in service to the Lannister family since he first came on the scene. The more work he did, the more he was promised bigger and better things. He’s still waiting for his castle and beautiful bride that was promised. All Jamie gives him is a bag of gold. It’s clearly not enough for him and he wants what’s owed. Don’t be surprised if he deiced to jump ship after continued false promises. Until then, he loyally carries out Jamie’s work and helps the Lannister army sack local farmers for their grain and supplies. Not much really going on at Kings Landing. Cersei tells Tycho Nestoris from the Iron Bank that soon enough, his organization will receive the payment from the Lannisters. He tells her he’s find of her interest payments. Much like your mortgage company, the Iron Bank likes those installments with interest versus the entire payment upfront. 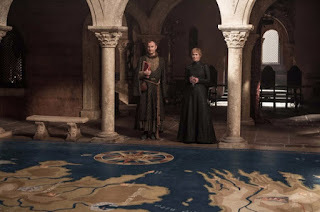 Cersei’s map is just about complete. She now wants to continue her campaign, which will probably require some support from the Iron Bank anyway, so their partnership continues. Littlefinger meets up with Bran who is continuing to weird people out with his Three Eyed Raven powers. Littlefinger gives Bran the dagger that was once used to try and assassinate him from way back in season one. Of course, he’s not doing it for the goodness of his heart. He has some ulterior Littlefinger-like motive in mind. We don’t get to find out what it is because as he’s trying to win over Bran, he mentions to him the “chaos” that he must have endured north of the wall as well as the chaos he has returned home to. Bran then mentions to him that “chaos is a ladder,” a saying that Littlefinger once said to Varys a while back as well. This surely creeps Littlefinger out. Lucky for him, Meera arrives to tell Bran that she’s leaving. Bran, no longer being the same person he once was, simply says thanks nonchalantly, causing Meera to tearfully leave as Bran is now no longer the young boy she met and sacrificed so much for. He has the knowledge and experience of all time and in effect the person she cared for died in the cave. Winterfell has a new visitor: Arya has come home. After dealing with two annoying soldiers at the gate, she finds her way into her home where she goes into the crypt to see her father’s body. She is shortly joined by her sister Sansa, who she hasn’t seen since season 1. Yet another Stark reunion to get everyone all excited. When (if) Jon returns to Winterfell, the gang will be all complete. 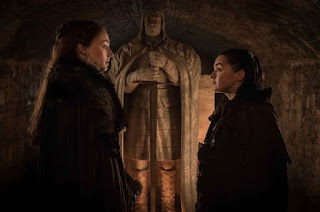 They have gone through hell and back and if anyone deserves to get back with their family members, it’s the Stark children. 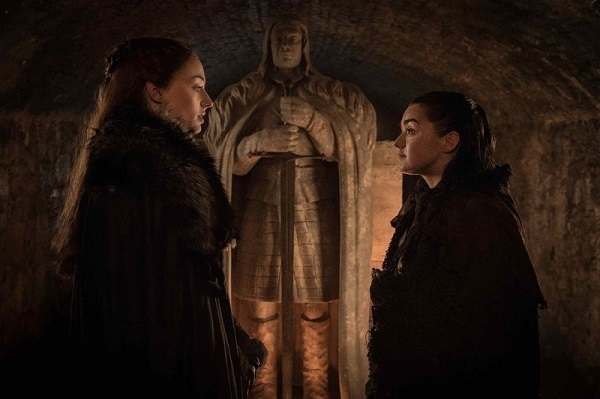 Arya tells Sansa about her “list” but it’s assumed to be joking. Only when the two sisters run into Bran at the famous weirding tree does Bran mention the list as well. Now Sansa realizes her sister is a badass assassin hell bent on killing those who have wronged her. Speaking of being a badass assassin, Arya observes Brianne and Podrick sparring and wants in on the fun. Arya wants to spar with Brianne, as she was tough enough to defeat The Hound (where is he and the Brotherhood without Banners by the way? ), Arya could learn from her. As the two engage in a friendly sword fight, it gets interesting. Arya fights Brianna and holds her own very well. The only thing working against her is her size and an annoyed Brianne gives her a massive kick that launches her a few feet to the ground. Arya fights very similar to her sword teacher Syrio and completely impresses everyone, even Littlefinger and Sansa. 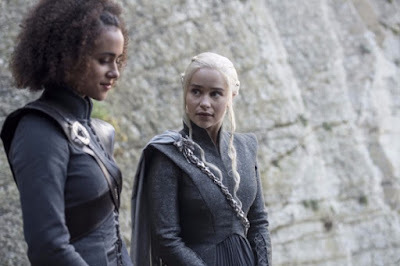 While waiting for an update from the Unsullied taking over Casterly Rock, Danny and Missandei are walking and talking when Jon comes from the caves to show Danny something. Not only do we get a good look at the endless supply of dragon glass, but then John shows Danny some of the local graffiti. Inside the cave are endless drawings made by the Children of the Forest made eons ago. The drawings show that not only did they live there at Danny’s ancestral home, but they also lived in union with the First Men. Even further in the cave showed drawing over their mutual enemy: the White Walkers. 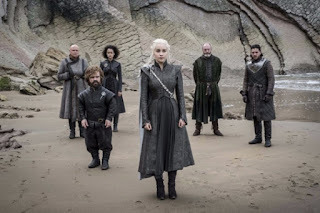 Not only does this show Danny that the threat of the Night King is real and not a fairy tale, but also that unlikely allies were made to fight them. This shows that Jon and Danny can work together. Danny still requires a knee be bent for her. Time will tell is Jon decides to do that. This was beyond epic and fun! While en route back to Kings Landing, the Lannister army finally met their match. Bronn hears a rumble and then Jamie realizes that they are about to be under attack. The Dothraki army rushes towards the Lannister army who are scrambling to get their defenses ready. Bron even tells Jamie to get out of dodge as they are about to be hopelessly slaughtered. Jamie’s no punk, and he actually believes that they can fight back the advancing army. That’s when they hear the growl of Drogon. Jamie for the first time has fear in his eyes as he becomes the next person to be completely flabbergasted by the sight of a dragon flying. On Drogon’s back is Danny who quickly starts having the dragon reduce the Lannister army to ashes while the Dothraki pummel through them and hack away. The entire sequence is about 20 minutes, but you are on your feet cheering and yelling at the screen the entire time as it’s beyond epic. While the fight is very one sided, that doesn’t mean that Jamie and Bronn don’t hold their own. Jamie kills a pretty good amount of Dothraki while Bronn is able to get a hold of the giant crossbow that Cersei and Qyburn were working on. 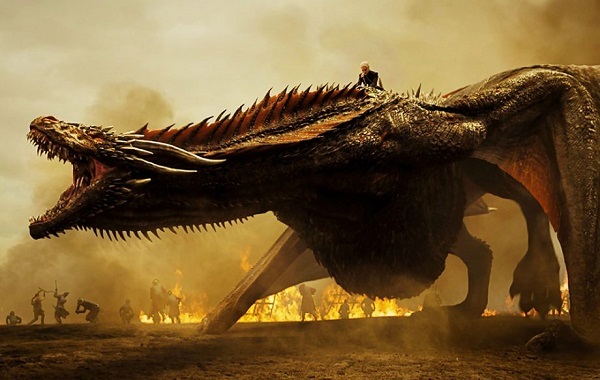 After missing his first shot, the second giant arrow hits Drogon sending the giant dragon towards the ground. While Drogon is injured, Danny tries to remove the spear from its hide. Jamie realizes that now’s his shot to kill her. If he takes her out, the Lannister’s will win as her army would be leaderless. There’s a reason Tyrion told her not to get in the fight, but she didn’t listen. Speaking of Tyrion, he watches his brother hopelessly ride towards Danny and her dragon, hoping his brother will not be killed. Jamie comes close in his charge, but then the dragon turns around and prepares to reduce him to ashes. Lucky for him, Bronn arrives at the last moment and the two barely escape a fiery death and crash into a nearby lake.